Favorite Vegas Wedding and Reception Venues: LVW’s Picks! 15 species of shark, and 1.5 million gallons of seawater surround the ceremony and reception venues at Mandalay Bay’s Shark Reef aquarium. 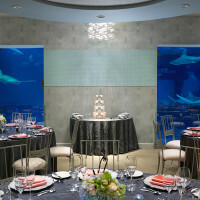 Weddings in the aquarium must take place before 9am, Sunday through Thursday, and only have space for 10 guests who must stand as the ceremony takes place inside the shark tunnel in the aquarium. The Seascape Ballroom opened in 2013, with an expanded reception space (and patio!) that envelopes you in marine splendour as sharks swim by you and your guests “under the sea” past floor to ceiling windows. With space for 80 guests, ceremonies and receptions are possible here from 7am to 11pm daily. 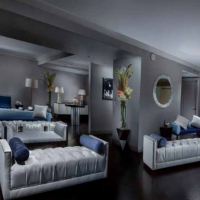 Receptions are only possible in this space as an add-on to an existing Mandalay Bay ceremony package. 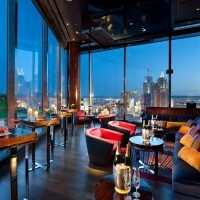 Mandarin Bar, located 23 floors above the Strip offers amazing views in a glass and wood heavy space. The hotel’s zen-like design and modern feel extends to the bar. You may either hold a ceremony and/or reception in the bar, or in a private room within the bar, called The Edge, made for more intimate gatherings of up to 30 people. See real weddings at Mandarin Bar at Mandarin Oriental featured on Little Vegas Wedding. 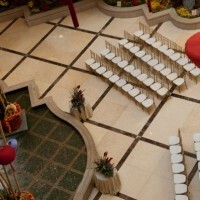 Not for the bashful or shy, this wedding ceremony takes place in the upscale shopping center attached to Palazzo and Venetian called Shoppes at the Palazzo. There is a beautiful, large atrium there with a tall two-story waterfall and preset decor that changes with the seasons. January and February celebrates Chinese New Year, March through May is an ode to spring, June and July offer a patriotic theme, July and August are summer, September through November are autumn harvest and December is a Christmas/winter display. The Venetian website does not do the best job of featuring photos of the various locations and options (watch this video for a good tour), but there are some very lovely indoor and outdoor options, many of which are quite public, so be warned if you are a private couple. Reception Options: In-house catering begins at $76 per person, hosted bars from at $31 per person. 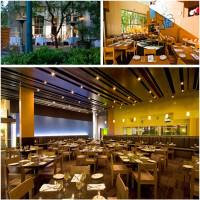 Popular on-site restaurant options include Canaletto, Bouchon, Carnevino, CUT, Delmonico and Grand Lux Cafe. Located steps from The Smith Center for the Performing Arts and not far from the lively Fremont Street in downtown Las Vegas, the DISCOVERY Children’s Museum is a new venue that is hosting eclectic and imaginative weddings and events. It’s perfect for couples seeking the unusual and offbeat for their wedding as it’s a three-story museum packed with crazy colors, educational displays and interactive exhibits promoting science, art and culture for kids. 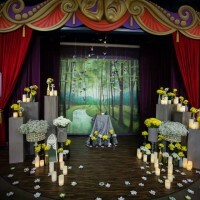 The venue best suited to hosting wedding ceremonies is likely Fantasy Festival, a theatre-style event with a stage for puppet shows you can get married on. Receptions are best in the 5,000 square foot Traveling Exhibit Hall. Classrooms can convert into bridal suites and groom’s rooms. However, the entire museum is available for customization and the special events staff will work with you to find the best set-up for your wedding. There are no outdoor sites at Discovery, but there are courtyards at the nearby Smith Center available.A full museum buyout is $10,000 and can hold up to 1,000 guests, for a five hour event, but packages can be customized for the couple. A list of preferred vendors is provided upon request. For more information and photos, visit the venue spotlight on DISCOVERY Children’s Museum. Border Grill at Mandalay Bay is a Mexican restaurant with many options for private dining space, both indoors and outdoors. 9,100 square feet of dynamic and flexible dining areas and colorful murals created by artists Su Huntley and Donna Muir make for a hip and lively backdrop for any celebration. The wedding chapel at Mandalay Bay also offers combined ceremony and reception packages, from $8250-23250 for 20-100 guests. The restaurant has a great variety of catering options available, including vegan and vegetarian meals, and upgrades like ice cream sundae bars, taco, paella and carving stations, premium bar packages and more. Brunch and lunch menus available, and dinner menus ranging from $58-69 per person. For a venue that can accommodate both ceremonies and Las Vegas wedding receptions, there is the elegant Havana Room. 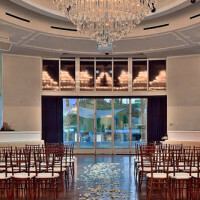 This breathtaking venue with grand chandeliers and dark wood floors also features state-of-the-art technology that allows you to change the lighting in the room to match your bridal party colors – or any other colors that you may choose. With support from the on-site wedding professionals, who are dedicated to making sure that you don’t have to deal with the details, Tropicana Las Vegas weddings are designed to make your special day a dream come true – from the walk down the aisle to the final toast at your reception. The Havana Room’s lavishly designed space is anchored by an enormous crystal chandelier as the focal design element and surrounded by more than 40 custom-built banquette-seating areas, three full-service bars, a dark wood dance floor and premium audio-visual technology. It is available for ceremonies and receptions. Reception Options: Inquire with Tropicana for catering costs.